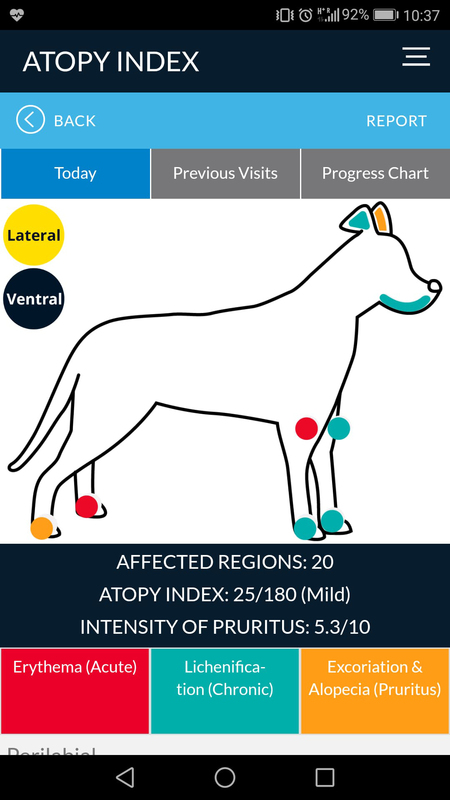 It has long been accepted that canine atopic dermatitis (CAD), much like human atopic dermatitis is underpinned by dysfunction of the patients’ adaptive immune response. Specifically, inappropriate production of immunoglobulins and activation of an inflammatory response as a result of sensitisation to environmental allergens. However, newer research into the pathophysiology of the condition has also discovered an important deficiency in the skin of patients with CAD. It has been suggested that dogs have reduced skin barrier function allowing increased allergen permeation (1). These two mechanisms are not mutually exclusive and it is possible that both play a role in the development of atopy. The abnormal presence of allergens that have permeated the epidermis may be a potential trigger for cell sensitisation during development of CAD. Structural changes in the skin of atopic dogs are notably a reduction in the intercellular lipid layer with disorganised lipid lamellae (1). Studies also show differences in the barrier function of skin in atopic and non-atopic patients (2). 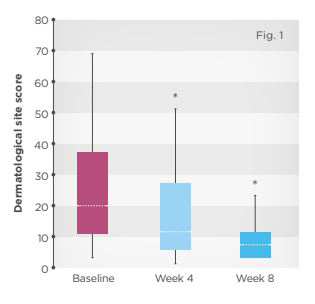 Transepidermal water loss (TEWL) has been used as a measure of skin barrier function to demonstrate this effect. A study using an experimental model of CAD showed increased TEWL assumed to be as a result of altered skin barrier function in patients with an experimental model of atopy (2). This finding has also been noted in dogs with naturally occurring AD (3). Importantly, in both of these studies the changes in barrier function could be measured in both lesional and non lesional skin. This improved understanding of affected skin barrier function whether cause or consequence is highly relevant to the management of CAD. These deficiencies have been shown to be present both in lesional and non lesional skin and structural changes are constant and present both during and between episodes of clinical signs. 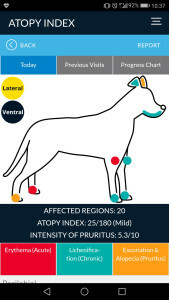 The International Task Force on Canine Atopic Dermatitis (4) has recommended a gold standard approach to management of CAD, which is to use more aggressive therapy for periods of clinical signs or atopic flares in addition to long-term maintenance therapy between flares that aims to reduce the incidence and severity of clinical episodes. One of the big considerations for clinicians when selecting such long-term management therapies for CAD patients is interventions with mild or no side effects. Use of carefully selected nutrients that can support the skin and coat could fit this brief. Considering the importance of maintaining barrier function as well as tempering the inflammatory response to allergens there are nutrients that may play an important role in these areas of recent interest. There are two nutrients to consider that can be utilised for their effects on cell sensitisation and cell activation during the induction and effector phases of CAD. The first is the use of egg, which has multiple potential benefits, including antioxidant and immunomodulatory properties (5,6). 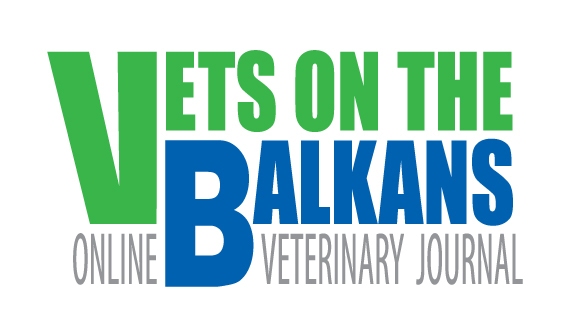 The immunomodulatory benefit of egg has been explored in skin sensitisation in dogs (7). Three groups of dogs were exposed to a novel antigen (keyhole limpet hemocyanin (KLH) in weeks 9 and 11 of a controlled food trial. The three groups were a control food, the control food and prednisone (at 2.2mg/kg bodyweight orally per day) and a food containing egg. An intradermal skin test (with KLH) was performed at week 12 and the results were as follows: both the prednisone treated group and the egg fed group had statistically significant reductions in the immediate and delayed-type (cell-mediated) hypersensitivity reactions compared to the control group. This response was similar between the egg and prednisone groups. These results support the findings that egg have immunomodulating properties (5,6), in particular in reducing allergen-induced hypersensitivity reactions. This nutrient may be of use when considering a food for patients with CAD. The other important nutrient group to consider are polyphenols, which are sourced from plant ingredients such as green tea, herbs and green vegetables. Polyphenols do also have strong antioxidant properties. Antioxidants are beneficial in foods for patients with CAD as it is a markedly inflammatory condition. Supplementation can support the patient’s own antioxidant defences in the face of free radical cellular injury caused by inflammation. Polyphenols, like egg, have also been shown to have specific effects tempering cell-mediated immune responses. Notably, they may inhibit antigen presentation, T cell cytokine release, B cell IgE production and mast cell degranulation (8-13). Use of these ingredients in pilot feeding studies of botanicals, containing polyphenols and antioxidants, in CAD has yielded reductions in levels of IL-31, IL-12p40 and other cytokines as well as reduced itching, hair loss and erythema (14). Image 1. 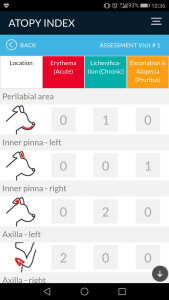 Fast and simple completion of the CADESI-4 skin scoring for CAD in the ‘Atopy Index’ APP developed by Hill’s. Download in your phone’s APP store . Following the identification of impaired barrier function in patients with CAD, studies have been conducted to identify nutrients to support the skin barrier. A key area has been to target the deficiencies noted in the intercellular lipid layer. A major component of this layer is ceramide; lower ceramide levels have been identified in the stratum corneum (SC) of patients with CAD compared to normal dogs (15,16). Oral supplementation of polyunsaturated fatty acids (PUFAs) appears to support improvement in at least some of these structural changes. One study found supplementation of AD dogs with PUFAs resulted in increased ceramide content in the SC and improved organisation of lamellae in the SC to be comparable to that of normal dogs (17). PUFAs have been widely trialed in both research and clinically as a management strategy for CAD for their anti-inflammatory effect and to nourish the skin and coat. The benefits of using PUFAs as an anti-inflammatory are through a reduction in production of pro-inflammatory eicosanoids and a reduction in stimulation of inflammatory cells. (18). This effect is largely mediated through Ω-3 PUFAs in contrast to the epidermal barrier support described above which is considered to be a factor of total Ω-6 intake. This requirement for both Ω-3 and Ω-6 fatty acids can complicate the interpretation of research findings in relation to PUFAs. Further work is required to completely understand PUFAs in this regard. From the current literature it is advisable to consider both the level of Ω-3 and Ω-6 PUFAs and their ratio to one another for optimum support. A low Ω-6 to Ω-3 ratio is considered anti-inflammatory, with an inclusion of sufficient total Ω-6 for skin barrier support. For this reason their inclusion in a complete food rather than supplementation on top of the patient’s own food will give better control. To complete the review of nutrients there are also macro and micro nutrients that can be added to the food and optimised for skin and coat support. These nutrients are applicable to all dogs not just patients with CAD. Protein, vitamins A and E, Ω-3 and Ω-6 fatty acids, zinc and copper all contribute to maintenance and repair of skin and coat. These benefits are well described in more detail in nutrition texts (19). Figure 1. 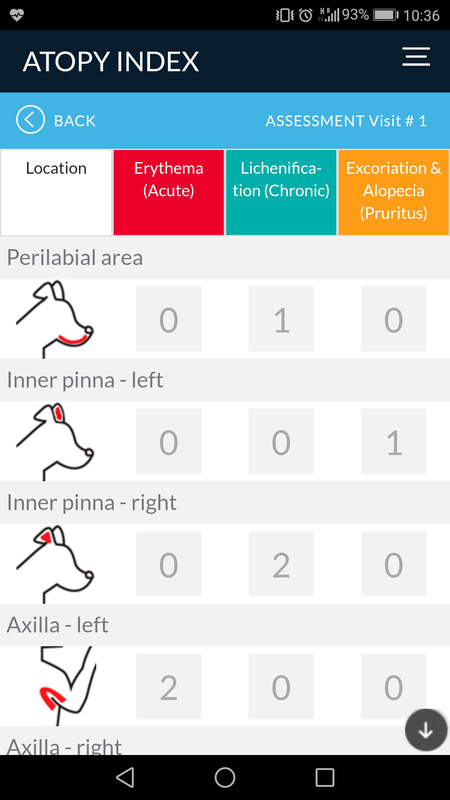 Median (range) dermatological scores in 20 dogs with CAD at baseline and at 4 and 8 weeks after being put on a dietetic food indicated for CAD. * p<0.05 vs. baseline. To assess the holistic impact of the discussed nutrients a study was conducted using a food indicated for patients with CAD. The food is a complete canine food optimised for skin support to include zinc, copper, antioxidant vitamins E and C and also containing egg, polyphenols and supplemented with both Ω-3 and 6 PUFAs. The study was constructed as an open label non-controlled feeding study of adult dogs with pre-existing AD. Patients were included on the basis of presenting with 5 or more of Favrot’s criteria for the diagnosis of AD (20). The dogs could be maintained during the study on standard therapy for AD including allergen avoidance, allergen-specific immunotherapy, symptomatic anti-inflammatory therapy and antimicrobial therapy as long as drugs, doses, and frequency of administration remained constant from the time of previous food administration through to completion of the study . Dogs were excluded on the basis of untreated infectious or parasitic dermatitis or concurrent skin or major systemic conditions. Also dogs were excluded if they had been fed with either food or supplements with high levels of Ω-3 fatty acids in the 12 weeks preceding the study. Dogs using oclacitinib were also excluded from the study. The owners were instructed to feed the dogs the food exclusively for 8 weeks and discontinue all any homeopathic remedies and other supplements. The dogs were assessed at 0, 4 and 8 weeks and at each assessment the attending vet completed a dermatological evaluation based on the Canine Atopic Dermatitis Extent and Severity Index (CADESI) (21) and owners completed an evaluation form at each visit and gave their opinion on their dog’s quality of life, skin and coat appearance, and food acceptance. The CADESI-4 scoring system is an important tool to provide an objective assessment of the situation and to monitor progress. 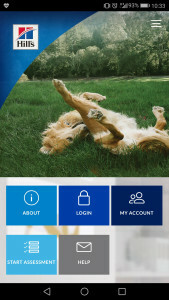 Hill’s has developed a simple in-clinic APP to facilitate CADESI-4 scoring completion, storage and visualisation to the pet owner. It can be downloaded via your app store on your mobile phone (Image 1). 20 dogs were included in the data analysis, 28 dogs were excluded prior to this due to various medication and supplement changes or missing data and 3 were excluded due to food refusal. For the analysed patient group both mean BCS and mean weight were stable during the study. 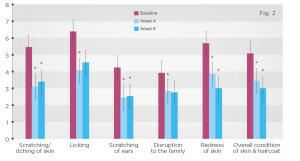 The results shown below show the median dermatological scores for the dogs decreased significantly at both 4 and 8 weeks when compared to the baseline (Fig 1). 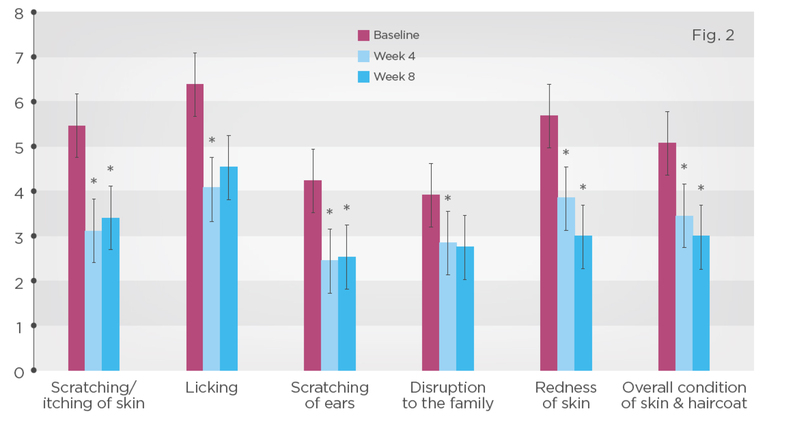 Owner assessments also showed significant improvements at the end of the study compared to baseline in the following categories: scratching, licking, scratching of ears, disruption to the family redness of skin and overall condition of skin and hair coat (Fig 2). Overall food acceptance was good with 90% of dogs eating the food for the entire study duration. Many dogs had to be excluded due to medication changes. The number that started and stopped medication was almost equal during the study removing selection bias towards milder or more severe cases. This results suggest use of these nutrients in a complete food shows improvement from both an owner perspective and in reducing dermatological scores for patients. The application of a food designed for use in patients with AD to reduce the inflammatory response, support skin barrier function and optimise skin and coat health could be considered as part of a multimodal approach to managing the patient with AD. Particularly considering that nutrition can be used simply on a daily basis both during and between clinical flares with no adverse effects to the patient.